This significant work is now reissued in paperback, without appendices. The text provides a detailed yet clear and accessible guide to English and international arbitration law. 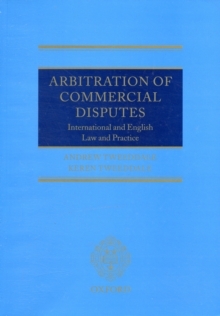 The book initially deals with the principles of arbitration as examined from an international perspective. The authors identify fundamental principles of arbitration law that are common to all jurisdictions, and show how some principles of arbitration law are treated differently in variousjurisdictions. 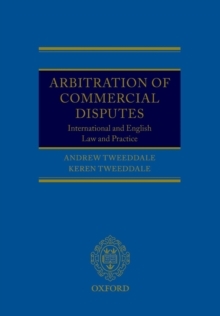 The book also examines some of the key jurisprudential questions, such as whether an international commercial arbitration is anchored to the place or seat of the arbitration, whether an arbitral award can be enforced even it has been annulled, and the continuing development and use ofthe lex mercatoria to resolve international commercial arbitrations. The sections on English arbitration law are structured around the provisions of the English Arbitration Act 1996. The work examines in turn the parties to the arbitration, the arbitration agreement, the powers and jurisdiction of the arbitral tribunal, the making of an award and its enforcement. In order to assist practitioners the authors have particularly focused on areas of the law which have changed over recent years and which are still developing. The book gives detailed analysis of courtdecisions and trends in areas where no clear authority exists, such as in the incorporation of arbitration clauses, and the drafting of arbitration notices. The book also deals thoroughly with costs and appeals. The final section of Arbitration of Commercial Disputes provides a comprehensive set of precedents. The precedents section includes both standard arbitration clauses and bespoke agreements, plus examples of clauses dealing with other forms of ADR prior to arbitration. There are also a number of procedural precedents including a set of Terms of Reference, Directions and a confidentiality agreement. There is finally a set of Awards and a section on applications to the Englishcourts.